Nairobi, Kenya, March 2013. Length is about 10 mm. Flies belonging to the family syrphidae are a very diverse and species rich group. The adults are very often found at flowers where they take nectar and will often be misstaken for bees: bright yellow and orange colors and hovering behavior together with bee-like buzzing. 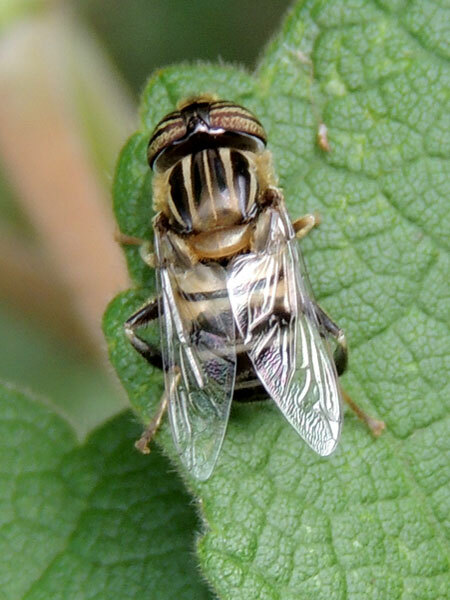 This ruse is a form of mimicry because many insectivores will ignore these flies because real bees can sting. The immature, maggot, stage of some species are predators on vegetation but even more are found in wet, submerged rotting vegetation. These semiaquatic larvae are sometimes referred to as rat-tailed maggots because they have long snorkle-like extensions of the abdomen for access to air above the muck.